So if you are a follower of my blog - firstly THANKS HEAPS and welcome. And secondly sorry for all the random updates you will be getting as I keep editing my older posts.If you have been interested in my patchworky bifold wallet tutorial and have yet to give it a go, you will be very happy to hear that two of my lovely readers Brittany and Ameliac2 have managed to pick up on some of my mathematical errors. I have mentioned before that I hate ruling and cutting fabrics and tend to guesstimate. Which is why for the foldable card slots in the tutorial I have 2 methods available to make them. One involves a ruler and the other just involves folding and ironing. Guess which guesstimation method I prefer? This version of my patchworky bifold wallet tutorial was sent into me my Brittany, the same reader who alerted me to some of the mistakes I have made in the tutorial. I am so grateful for her input, as it helps people who are also interested in giving this tutorial a go. Not only is this wallet beautifully handmade, Brittany completed it with less than one hour prior experience with her sewing machine! So if you have been meaning to give this a go and been to scared, don't be! She has perfected the zip and credit card pockets, and done an amazing job with the front cover with a plain fabric strip and decorator fabric around it. If you read my post about the reading pillow earlier this week, you will remember I lamented (read: complained) about how hard it is to sew/craft gifts for 50% of the population. The Sandi ID wallet is unisex but it is mostly geared towards women. 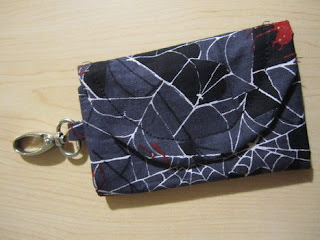 However, Guayaba has managed to make the perfect gift for either a guy or girl with the Sandi ID wallet pattern. 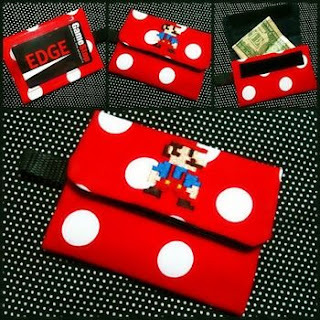 She has added a machine stitched mario, a square flap and velcro closure for her wallet. This next featured project is another version of the Sandi ID wallet by B. 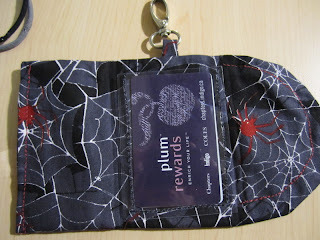 She made the wallet as an party pass holder over halloween - which is another great way in which you can use this versatile pattern. She also managed to make it from leftover halloween fabric as well - a great scrap fabric buster. It is so gratifying to see that people have been inspired enough to use my tutorials to create and craft their own handmade items! I would love to see more versions of any of my projects from the smaller jewellery ones to the bigger sewing ones. So if you have given any of my tutorials a go or have any questions about them don't hesitate to comment and message me. Hope to hear from some of you soon and as always happy crafting! with a longer tab to clip onto my workplace lanyard. I only had really think vinyl so I covered the top edge with fabric to make it a little more sturdy. Your pattern is perfect! Thank you again! Thank you so much for stopping by and commenting. I love love love your version of the ID wallet. I will keep it in mind to feature when I write up my next post on project versions. I'm glad you managed to follow the tutorial easily, I'm always worried that my no grammar style of writing confuses people, hence all the photos!